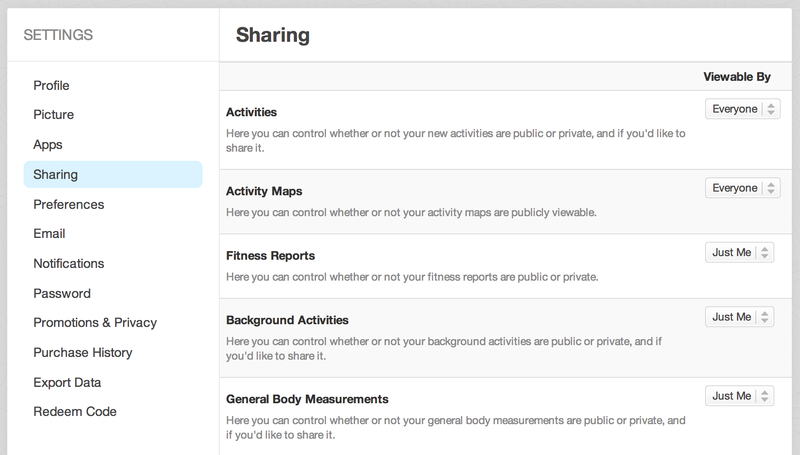 Select the Friends option and only your friends on Runkeeper will be able to access your workout data. The Everyone option means people who do not have a Runkeeper account have access to your workout data. You can also just set "Activities" to everyone to share to social media but your trip map will not show. For the ultimate private Runkeeper experience you can choose to have your settings set to "Just Me." This means that no one outside Runkeeper can see your the selected data nor can any of your Runkeeper friends. Most people use this setting for "Weight" and "Body Measurements" and when you sign up for an account - those selections are automatically set to "Just Me". Limitations: You can not share data with anyone, at all, ever. For details on how to update your sharing settings check out this article!